Each and every hero in Arena of Valor has their own unique characteristics. Understanding this will give you a major advantage in battle. 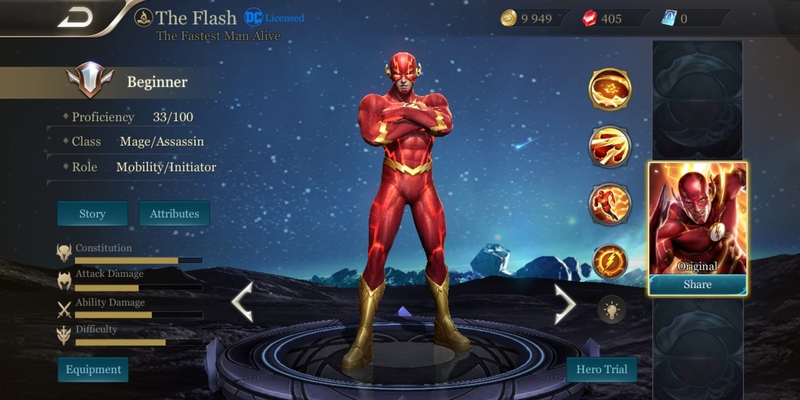 Below is an introduction to The Flash's abilities to help you better learn how to use this hero. Passive: The Flash accumulates stacks of his passive as he moves. He can also use Ability 1 to accumulate stacks more quickly. His passive grants him an extra shield and slows the enemy, greatly improving his melee combat capabilities. Ability 1 allows The Flash to move quickly over long distances. This ability is great as an escape tool and as a finisher. You can use his other abilities while this ability is in effect. You can also use another ability to cancel it. Ability 2 is The Flash's main source of damage. Hitting an enemy with this increases his movement speed and is great for both harassing and chasing. Ability 3 deals damage to multiple enemies. Both his and the enemy's movement speed are decreased while using this ability. There is also a control effect after use. This ability is a great opener for teamfights, and he can't be targeted while using it. The Flash mainly relies on Ability 2 for damage which also has a short cooldown. Focus primarily on leveling Ability 2 followed by Ability 1 then his Ultimate whenever available. 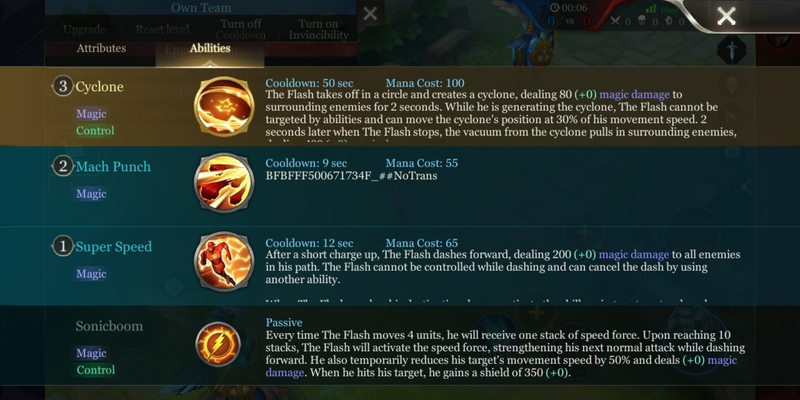 The Flash's passive relies on him moving and using Ability 1 to gain stacks. In the early game, you can rely on his passive and normal attack to harass while laning. The distance covered while using Ability 1 is quite long. If you don't cancel Ability 1 while chasing down an enemy, you might end up traveling too far. While Ability 1 is in effect, you can tap it again or use another ability to cancel it. The second stage of Ability 1 will deal extra damage when it hits an enemy. Ability 2 is The Flash's main source of damage. Hitting an enemy with this ability increases his movement speed. The final stage deals double damage, so try to hit enemies with every strike to maximize its damage. Ability 3 is a good teamfight opener. It also has a protective effect. 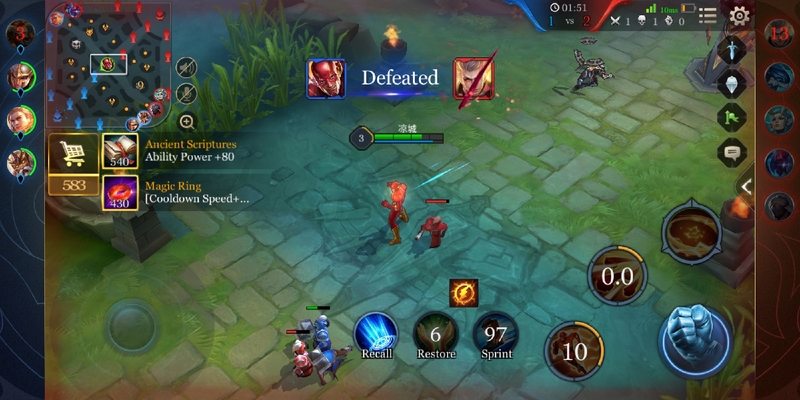 When a teamfight breaks out, you can first use Ability 1 to get fight then use Ability 3 to control as many enemies as possible, giving your teammates a chance to deal damage. You can also use your Ultimate to avoid taking damage when surrounded by enemies. The Flash's Ultimate is very important. Ability 1 can be used to flee or chase, greatly increasing his survivability. We hope you find the above analysis of The Flash's abilities useful!